Of course I have no idea if anyone ever reads this blog or not, so I don't know if it's been missed. But maybe that's the point. You do something and it shouldn't be about the outcome, it should be about the process. When I was identifying my archetypes, I added one that wasn't in Caroline's arsenal, which was Strategic. I've always been very goal-oriented, which is usually considered a successful trait in a human being. Certainly it's supposed to be the first and pivotal step for success, right? Well, maybe not. Maybe it is about the journey and not the destination. 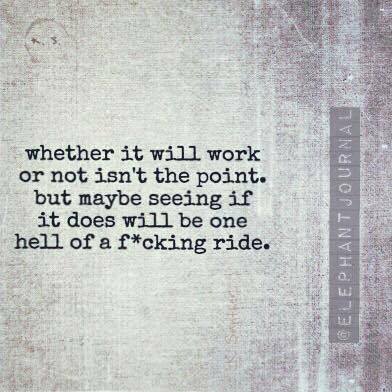 Maybe it's about appreciating the process; enjoying the ride. I've experienced some fears lately. I'm not usually a trepid person, so this was especially profound. Yes, of course, I carry the burden of my prescient nature, seeing the horrors of what I predicted after the election coming true. The further destruction of our planet, from values to the environment to the impending threat of nuclear war. But other than that Mrs. Lincoln, how did you like the play? Seriously (or perhaps more accurately, Less Seriously), I usually just proceed with the things I need to do, fear or not. But these two things have been daunting. The first project has played out my fears. I was right to be concerned. It's been arduous, to say the least. And certainly far from fun. It's the process of getting my books into a distributor – from ISBN numbers to uploading the myriad of complex files and more. Ugh. Exhausting. And with a deadline of the end of April looming, I had to bite the bullet and do it. Add to that my "positive pessimism" mindset and, well, let's say it shouldn't be surprising that (a) I've been busy and (b) I've been down-in-the-dumps. The other fear? I'll table that reveal for a future post. It might be another failure, but here's to hoping it's more fun in the journey.